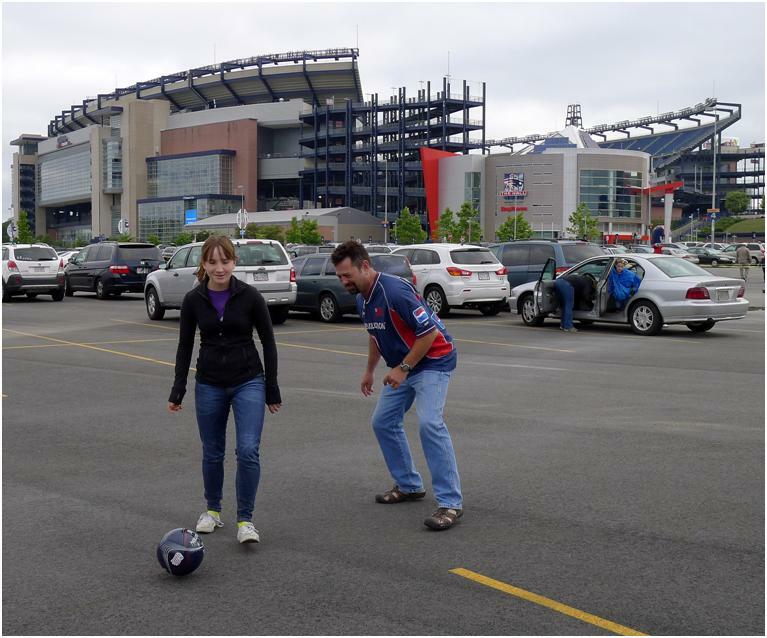 Tailgating: Its not just for football anymore…its also for futbol. It may be months before the next NFL football game but that was no reason not to tailgate. We were staying with our cousins Alex and Joanne – New England Patriots season ticket holders – in Pepperell, about forty miles from Boston, when Alex suggested that we go to the New England Revolution Major League Soccer game against the Columbus Crew. Why not? There were some changes of course. Instead of throwing passes in the aisles — and watching for Qualcomm’s stadium’s fascist “no throwing” cops (“no, officer, I’m not throwing the ball, I’m just holding it because I love the way it feels”) — we felt free to juggle, pass and play a bit of one on one. 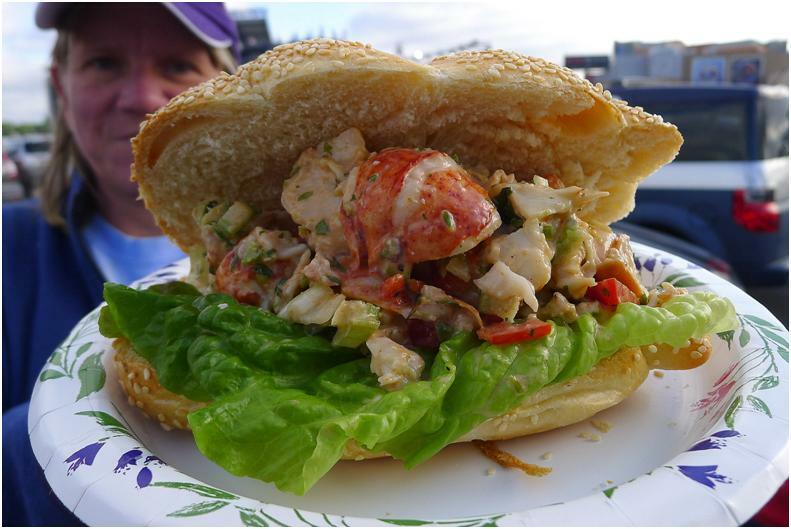 The question of what to make for the tailgate was not a difficult one: Lobster Rolls. As much as I love Fried Clams (and New England Clam Chowder…and there’s nothing wrong with an occasional batch of Boston Baked Beans) in my view there is be no food more closely associated with New England than lobster. And Lobster Rolls are the perfect Lobster delivery mechanism. At its most basic, the Lobster Roll is a sandwich filled with lobster meat. 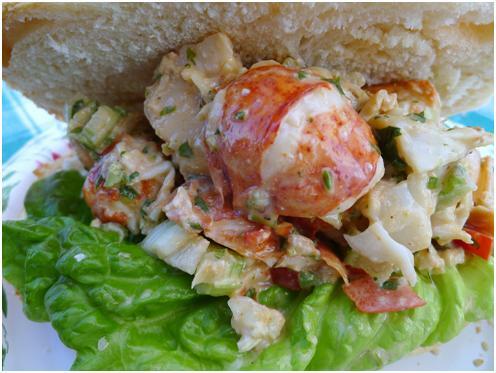 Traditionally, it is cold lobster salad filling a toasted hot dog bun (often with the joint side flattened so that the open, lobster-filled side faces straight up). Unlike the rest of New England – or, for that matter, Canada’s Maritime Provinces – in Connecticut (and pretty much Connecticut only) Lobster Rolls are filled with hot lobster meat held in drawn butter. 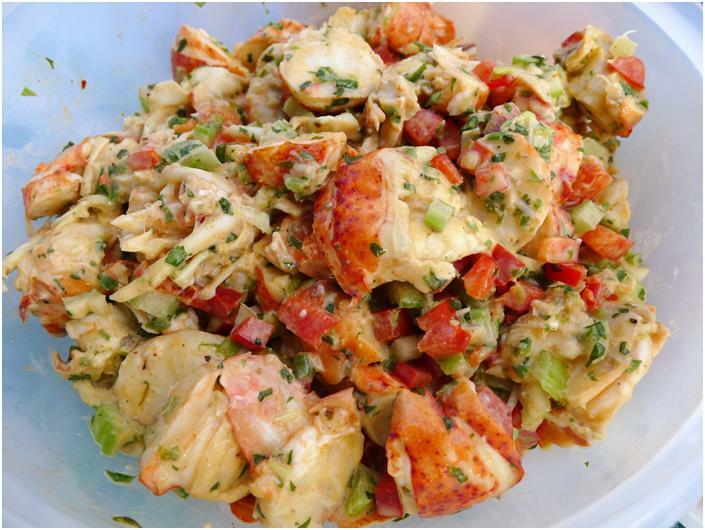 Elsewhere, it is a cold lobster salad consisting, generally, of cold lobster meat and diced celery. For those of us with some roots in or around New England, this sort of Lobster Roll feels like it has been around forever. In reality, it is a tradition that would appear to date back no more than 100 years inasmuch as the yeasty hamburger/hot dog bun was invented in 1912. Lobster salads date back to the 19th Century and Emma Paddock Telford’s New York Evening Post Cook Book [New York, 1908] features a recipe pairing a curried lobster salad with toast. But as much as I love the traditional lobster roll – and in its simplest form it is a thing of beauty unto itself — I wanted to do something just a little bit different with it. On or way from Washington DC to Boston we had stopped in Hartford, Connecticut at a Peruvian restaurant – a first for us – and fell in love with Peruvian Aji Sauce, a ubiquitous presence on Peru’s dinner tables. 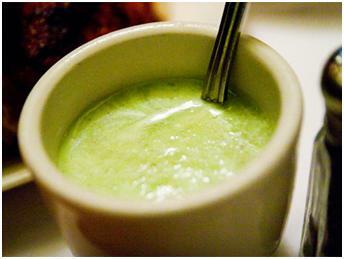 The Aji sauce is a mayonnaise-based puree of jalapeño peppers, green onions and cilantro. It is used in Peruvian cuisine as an all purpose condiment, dipping sauce, grill sauce, salad dressing…and that led to the obvious question: why not use it in Lobster Rolls? We decided to use the basic ingredients for an Aji sauce but mince them instead of pureeing them in order to add a bit of color and texture to the Lobster Salad. One last word on Lobster Rolls: please, please, please don’t shred your lobster. It is an insult to the bug…and to my culinary sensibilities. The larger the chunks the happier you will be. Make the Mayonnaise. Place the egg, egg yolk, minced garlic, Dijon mustard and lime juice in the bowl of a food processor fitted with the “S” blade. With the motor running, drizzle the canola oil into the bowl of the processor through the feed tube in a very slow, steady stream – barely more than a drizzle. When fully combined, taste the mayonnaise and season to taste with salt, pepper and acid. Make the Aji Sauce. Combine all of the ingredients in a mixing bowl and whisk to fully integrate. If using other than in this recipe, puree the ingredients in a food processor, high speed blender or blender. Make the Lobster Salad. Chop the lobster meat, keeping the pieces as large as possible such that they will still fit into the sandwich. Place the minced celery, bell pepper and lobster meat in a large mixing bowl along with ½ cup of the Aji Sauce and mix to combine thoroughly. Make the Lobster Roll. Toast the rolls, if you wish, or use them un-toasted (especially if the rolls are of the crusty variety). Add as much lobster salad to the rolls as will fit in them and as you wish. More is, quite often, better. So you have to eat some off the plate? There are worse fates.